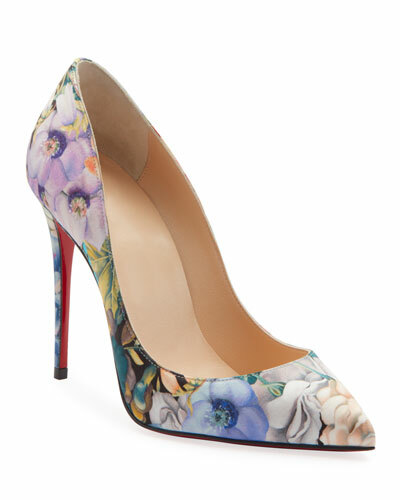 More Details Christian Louboutin floral-print satin pumps. 4" covered stiletto heel. Pointed toe. Slip-on style. Signature red leather outsole. "Piagalle Follies" is made in Italy. More Details Christian Louboutin satin pumps with PVC trim. 3.3" covered stiletto heel. Pointed capped toe. Crystal-embellished T-strap vamp. Adjustable ankle strap. Signature red leather outsole. "Nosy" is made in Italy. 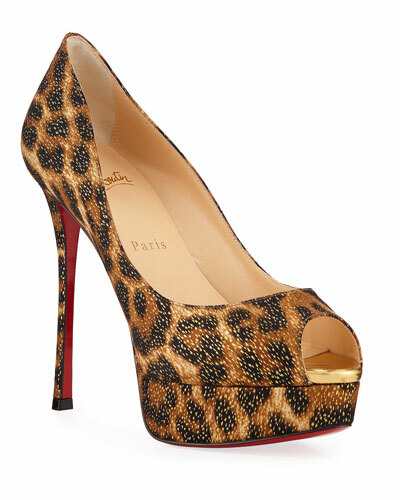 More Details Christian Louboutin leopard-print crepe satin pumps with metallic accents. 5.3" covered stiletto heel with contoured platform. Peep toe. Slip-on style. Signature red leather outsole. "Fetish" is made in Italy. More Details Christian Louboutin satin pumps with PVC trim. 4" covered stiletto heel. Pointed capped toe. d'Orsay silhouette. 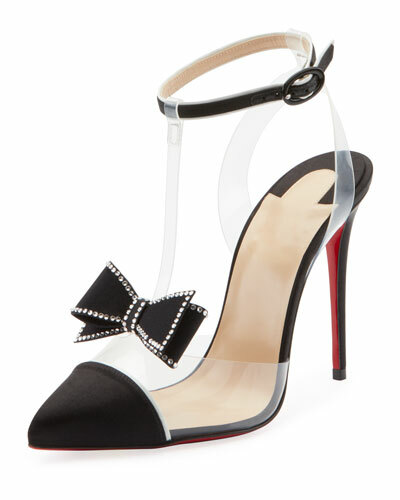 Crystal-embellished bow at T-strap vamp. Adjustable ankle strap. Signature red leather outsole. "Naked" is made in Italy. More Details Christian Louboutin pump in satin, leather, and PVC with crystal and spike embellishments. 4" covered stiletto heel. Pointed toe. d'Orsay silhouette. Self-tie ankle strap. Leather lining. Signature red leather outsole. "Mechante Reine" is made in Italy. More Details Christian Louboutin satin and PVC pumps. 4" covered stiletto heel. Pointed capped toe. Embellished T-strap vamp. Adjustable ankle strap. Signature red leather outsole. "Nosy Strass" is made in Italy. More Details Christian Louboutin satin pumps with PVC trim. 0.2" covered stiletto heel. Pointed capped toe. Crystal-embellished T-strap vamp. Adjustable ankle strap. Signature red leather outsole. "Nosy" is made in Italy. More Details Giambattista Valli satin pumps with ostrich feather fringe. 4.3" stiletto heel. Pointed toe. Asymmetric vamp. Slip-on style. Slingback stretch strap. Leather lining and sole. Made in Italy.